Mercedes M. Yardley, Beautiful Sorrows. Apex Publications, 2017. Pp. 156. ISBN 978-1-93700-953-3. $13.99. Beautiful Sorrows is a collection of fantasy, weird and horror stories by Mercedes M. Yardley that has been recently re-published by Apex Books, after its first appearance for Shock Totem Publications. The collection gathers twenty seven stories of different lengths, from very short flash pieces that do not last more than couple lines, to longer and more complex ones. The book comes with an enthusiastic introduction by P. Gardner Goldsmith that it is, I believe, what every author dreams of reading in the opening words that accompany their book. Beautiful Sorrows is not only described using a long list of superlatives, but is compared to nothing less than the songs of the Sirens. Even before my expectations were raised by so flattering an introduction, I was already looking forward to reading this book. I have always enjoyed horror stories, but it seems to become more and more difficult to find good examples that do not fall into misogynistic stereotypes and that resist the temptation of gore for its own sake (something that may work for others but leaves me quite cold). Two things attracted me to this title, when I chose it. The first was that the author was a woman so, hopefully, the range of characters would have been more varied and the roles less predictable. The second was the slightly melancholic and oneiric atmosphere that, according to what the blurb suggested, pervaded the stories. In a way, both things were actually in the book. Yardley’s collection definitely features more female characters, and in a variety of roles, than the average horror stories. Not only are there several women protagonists, but they also show agency, communicate a personal point of view, and sometimes have occupations that are not stereotypically associated with women. In the story “Axes,” for example, the brutal murderer is a woman, as well as the neighbour who accidentally witnesses one of the crimes (becoming the next designated victim) and who, incidentally, is (literally) a butcher. Also the surreal, absurd and even fabulist are definitely to be found in the pages of this book. Deviations from realism go from small fantastic details, such as a sentient tie in “Untied,” to entire stories that feature winged boys and invisible girls as protagonists. However, I didn’t fall in love with this book, for a number of reasons that, in the end, turned out to be for me more relevant than the things that could have made it enjoyable. In the first place, there is the horrific component itself. If it is true that in some stories Yardley can show levity and a certain sweet weirdness (occasionally bordering with cheesiness), the rest of her tales describe far-too-real horrors. I know, if you read a collection of horror stories you can’t really complain about finding horror. But I guess it all comes to what one means by horror. Or, even more simply, what kind of horror one likes. A story like “Black Mary,” that deals with abducted and abused little girls, is not the kind of horror I am interested in. First of all because it feels painfully too real, and if I were looking for that kind of creepy and revolting stories, newspapers or archives would be, sadly, full of them. But it is also about the way in which such stories are presented. It is, of course, a personal choice, but there are things that I don’t want to see in the literature I read. Abused children is definitely one of those. It’s not just because it horrifies me (and not in a good way) but also because I would really like the image of tortured, secluded, violated women, and especially young women, to stop being an ubiquitous trope in literature, and especially in horror. From this point of view, Yardley didn’t distance herself enough from the position usually held by her male colleagues. Her stories are still full of women victims. In a couple of occasions, like in “Extraordinary Beast,” the male killer is even handsome and irresistibly attractive. As if being killed by him was the ultimate turn on. Again, that is exactly the kind of things I do not want to read. I don’t expect everyone to agree with this. But these are the reasons why Beautiful Sorrows for me was an hard, and sometimes infuriating, read. I am sure many other readers will find it perfectly enjoyable, as the almost unanimous good reviews this book has received seem to prove. 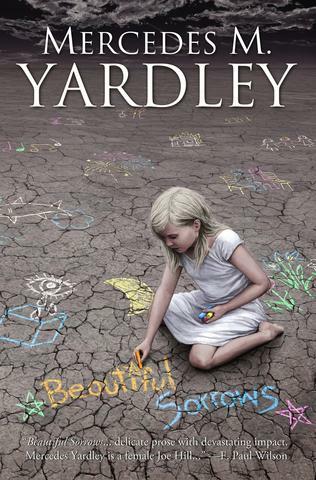 Yardley’s stories are, in some respects, refreshing, and I did appreciate how she counterpoints unreal elements to the most mundane reaction. The absurd and the grotesque penetrate reality in a discrete and sometimes amusing way. Horror lovers that look for something slightly different and that are happy to venture into different genres might like this collection as much as the introduction assures us they will. In particular if they don’t mind stories where women are victimised and the abusers eroticised.